Arizona Congresswoman Gabrielle Giffords, the wife of NASA astronaut Mark Kelly, was shot in the head in Tucson today (Jan. 8) at a public event during a violent attack that killed five people – including a 9-year-old child – and injured several others. Giffords, 40, is in critical condition and responding to doctors after undergoing surgery, according to doctors at the University Medical Center of Tucson. At least 11 other people were also injured when a gunman opened fire at a Safeway grocery store, CNN reported. Giffords (D - Ariz.) was holding a constituent meeting at the store when she was shot in the head shortly after 10 a.m. MST (12 p.m. EST). The suspect in the shooting is reportedly in custody, according to a statement issued by the U.S. Capitol Police. President Obama called the shooting in Arizona "an unspeakable tragedy" in a statement released by the White House. "And while we are continuing to receive information, we know that some have passed away, and that Representative Giffords is gravely wounded," he added. In a televised statement, President Obama said Giffords is a friend and well-liked in the political world. He assured a full investigation is under way. "We are going to get to the bottom of this, and we are going to get through this," President Obama said. Giffords and other victims in the shooting were taken to the University Medical Center of Tucson. The hospital's trauma director Peter Rhee said Giffords is out of surgery and is responding to commands. He said Giffords was shot through one side of the head "through and through," but she is recovering. "I'm about as optimistic as it can get in this situation," Rhee said in a press conference at the hospital. Officials urged members of the media for patience after earlier reports of Giffords' death proved to be premature. Rhee said that 10 shooting victims are at the hospital, five of whom are in surgery and five others are in critical condition. Rhee also said another victim, a 9-year-old girl, has died. Giffordswas first elected in 2006. She holds seats on the House Science and Technology and House Armed Services committees and has served as chairwoman of the House Space and Aeronautics Subcommittee. She is also married to NASA astronaut Mark Kelly – a veteran of three space shuttle flights – who is scheduled to command the final flight of space shuttle Endeavour, which is slated to launch April 1. 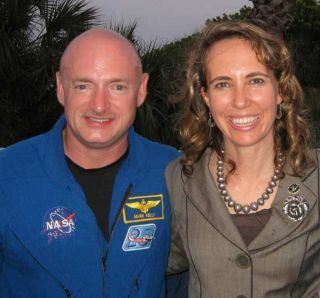 Giffords' brother-in-law Scott Kelly, is also a NASA astronaut. He is Mark Kelly's identical twin brother and is currently living aboard the International Space Station as commander of the Expedition 26 mission. NASA chief Charles Bolden said in a statement that the U.S. space agency is " deeply shocked and saddened" by the shooting of Giffords and others in Tucson. Giffords is a personal friend, Bolden added, and she has been a long-time supporter of NASA and is a "strong advocate for the nation’s space program and a member of the NASA family." "We at NASA mourn this tragedy and our thoughts and prayers go out to Congresswoman Giffords, her husband Mark Kelly, their family, and the families and friends of all who perished or were injured in this terrible tragedy," Bolden said. The motive for the today's shooting is unclear. "We're just trying to sort this out right now," sheriff's spokesman Deputy Jason Ogan said, according to CNN. "We do not yet have all the answers," President Obama said in his statement. "What we do know is that such a senseless and terrible act of violence has no place in a free society. I ask all Americans to join me and Michelle in keeping Representative Giffords, the victims of this tragedy, and their families in our prayers. Editor's Note: This story was updated to reflect the fact that Giffords is in critical condition, after early news reports prematurely reported that she had been killed.